I hiked this area in the winter of 2016, which is long enough ago that it was a reasonable choice for a quick hike on a beautiful day. Friday I was tied to the house much of the day, both catching up on chores and being available while the ABA therapist worked with Michael, my youngest son, who is autistic. ABA, Applied Behavioral Analysis, is one of the few behavioral interventions for higher-functioning autistics that has a good track record. We’ve seen it do wonderful things for our son. I wish we could have started it earlier, but for many years it was done in our area only by a clinic that only accepts Medicaid patients. And our household income is much too high to qualify. Now, understand, it’s not that our insurance wouldn’t pay for it (though they wouldn’t, until recently); the clinic would not work with Michael even if we paid with our own money. Apparently this was some kind of regulation laid down by the State of New Mexico on autistic services throughout the state as a result of a Medicaid fraud scandal some years back. I don’t really understand it, but then I’m convinced there is much about bureaucratic government that cannot be understood by stable minds. Pardon the digression. The takeaway is that ABA has been wonderful for Michael but it tied me up most of Friday. Once I was freed up, which was around 4:00, I looked for somewhere I hadn’t hiked in a while that was nearby and where I wouldn’t miss my newer camera too badly. The trail behind the Clinton P. Anderson Overlook seemed like a good choice. I would take the old camera, but since I’ve been here before (some time ago) it would not be a big deal that the photographs would be poorer quality. This would be a quick hike, mostly for the exercise. The pullout is opposite the trailhead, which means crossing a rather busy road. 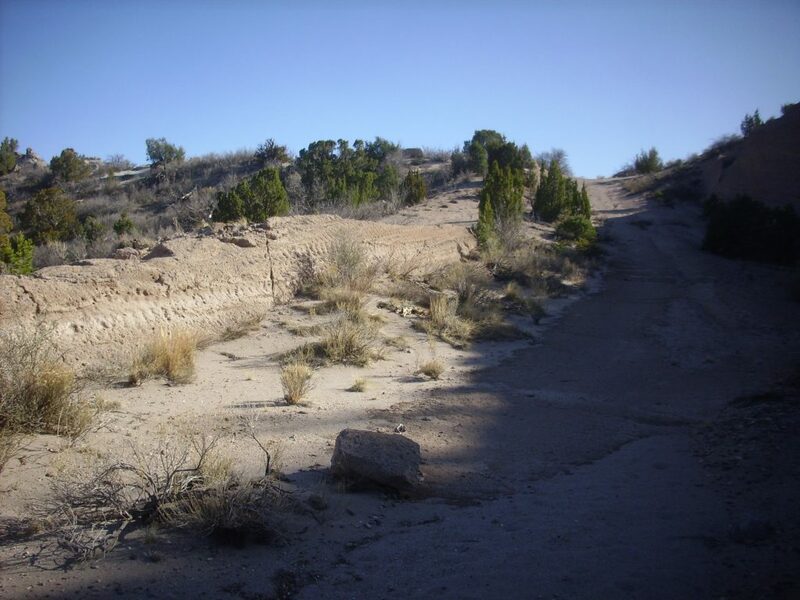 The trail follows the old road to the top of Los Alamos Mesa. The road has been blocked with large boulder and barbed wire, but there is a gap for hikers. 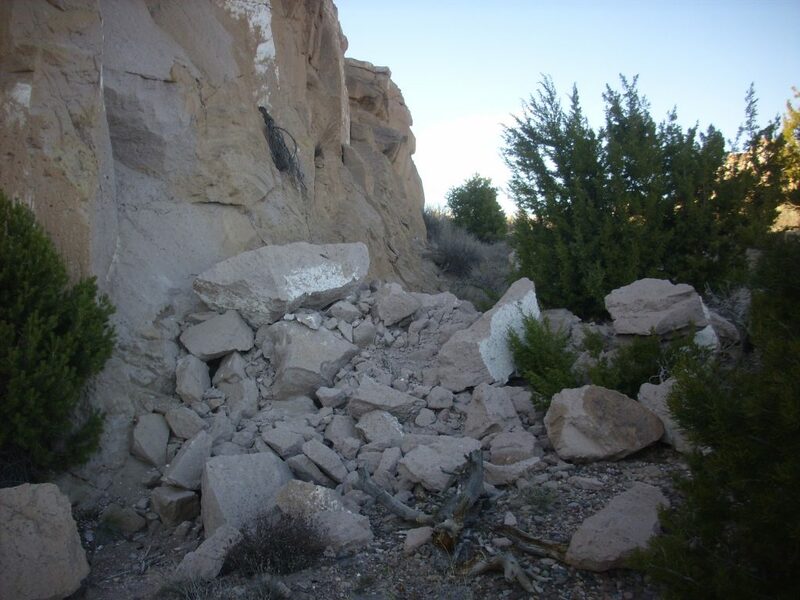 If I’m not mistaken, the road was carved back in 1943 by the Army Corps of Engineers out of solid ignimbrite of the Tsherige Member, Bandelier Tuff. 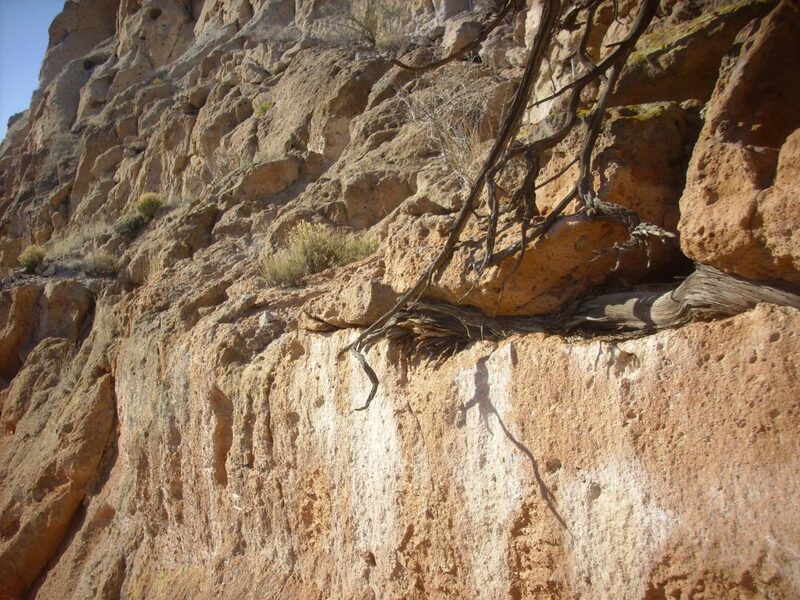 The Bandelier Tuff forms the characteristic finger mesas of the Jemez region, and contains ignimbrites from at least four separate eruptions. 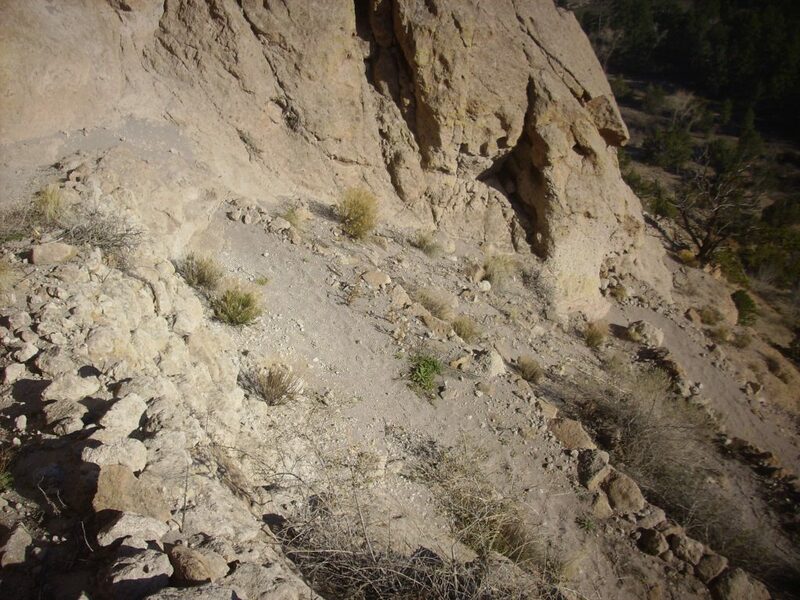 The two largest and most recent occurred 1.62 and 1.25 million years ago (according the latest high-precision argon-argon radiometric dating) and formed the Otowi Member and Tsherige Member of the Bandelier Tuff. The Tsherige eruption 1.25 million years ago also produced the Valles caldera. Some impressive bulldozing was required to build the road. 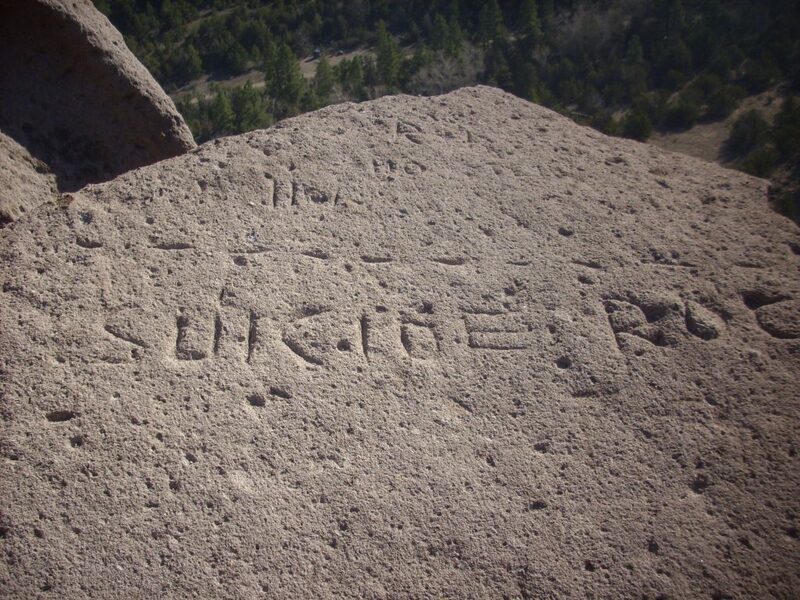 At the top, and in the surrounding area, there are a lot of historical era petroglyphs. 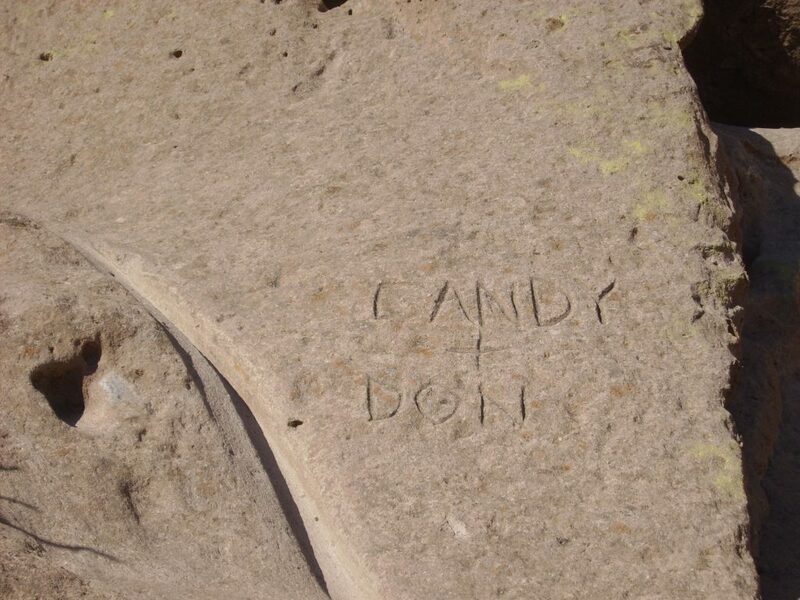 I found myself wondering if Candy and Don are still together. Assuming they ever were: Although I have no specific memory of it, it would not surprise me if “Kent + Michelle” was carved on a hapless tree somewhere, even though Michelle moved away before I reached dating age and could have had the opportunity to be rejected by her. My first real crush. 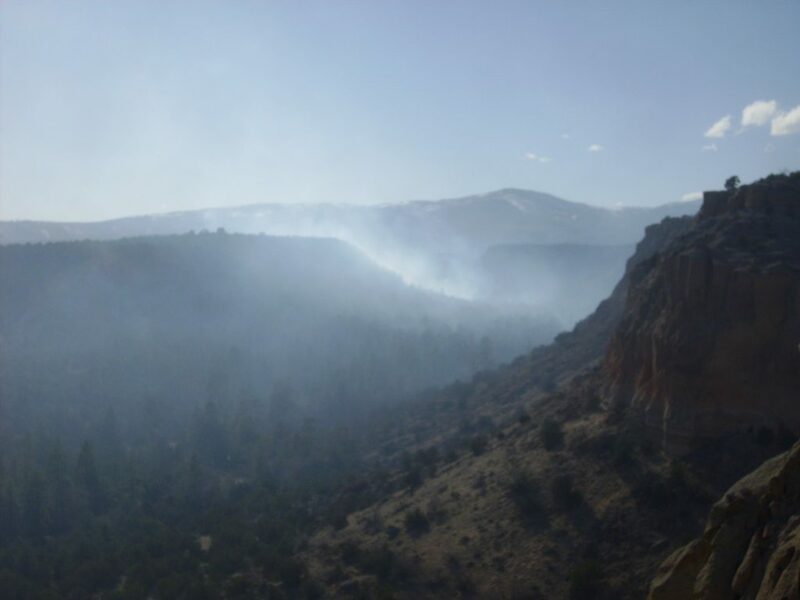 The Tsherige Member was erupted in several pulses, which most geologists believe took place within hours to weeks of each other, based on the evidence that little cooling took place between pulses. There have been various classifications proposed for different layers with the Tsherige Member, which I’m beginning to learn how to distinguish in the field. 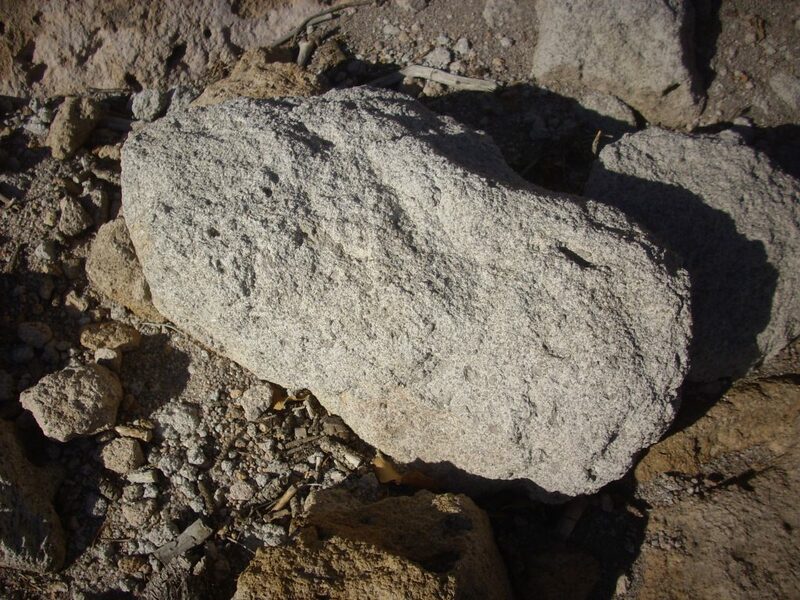 There is some rockfall nearby of particularly lithic-rich Tsherige Member that is probably from the “C” unit. This is not cemented as tightly as the tuff lower down, and so tends to form a slope between the cliff-forming B and D units. I noticed the last time here that there is a strikingly sharp color transition partway up the C unit. Notice how the color abruply changes from pink beneath to lighter above. The rock is otherwise identical. 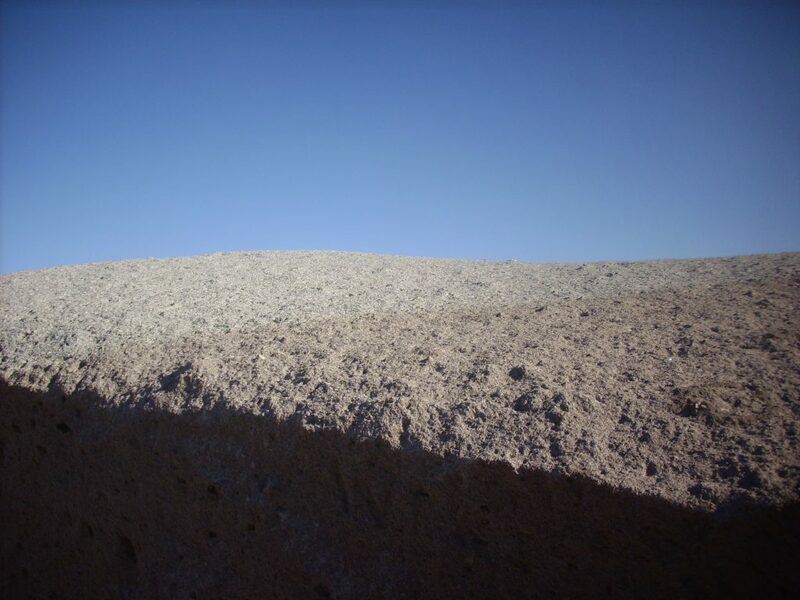 I do not know its significance, other than that the similarity in rock above and below, except for color; and the lack of any sign of a textural change at the boundary, suggests some kind of vapor phase process. There was a lot of water vapor and other gases in the freshly deposited ignimbrite, and a lot of weird chemistry went on that abruptly changed across vapor fronts in the rock that are still not well understood (at least by me, though I don’t see a lot of coherent explanations even in professional papers.) This is not even the most striking example in this area. There is a small fire up canyon. It looks like a small wildfire near LANL’s Neutron Physics Facility. There were emergency vehicles in the area, so it wasn’t a controlled burn. I may hear something about it Tuesday whem I’m back to work, or perhaps something in the paper Monday. 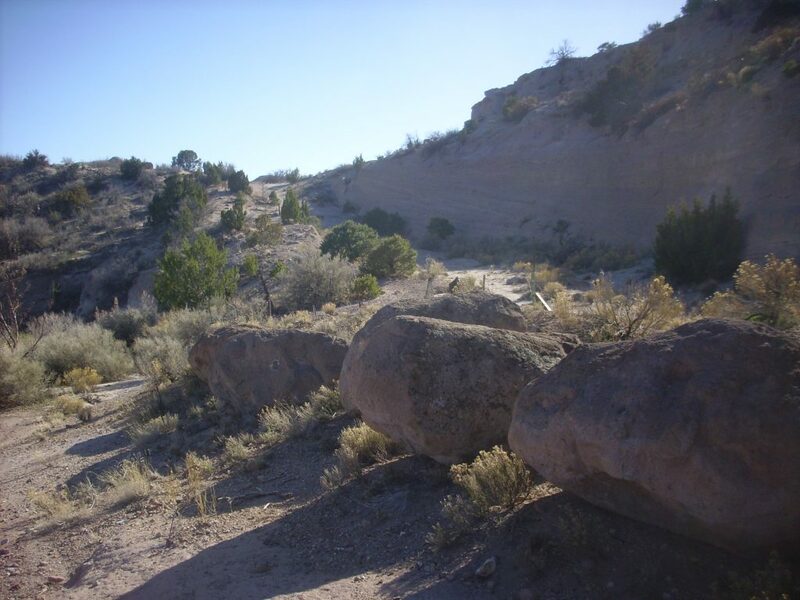 I head for the Breakneck Trail on the south side of Los Alamos Mesa. 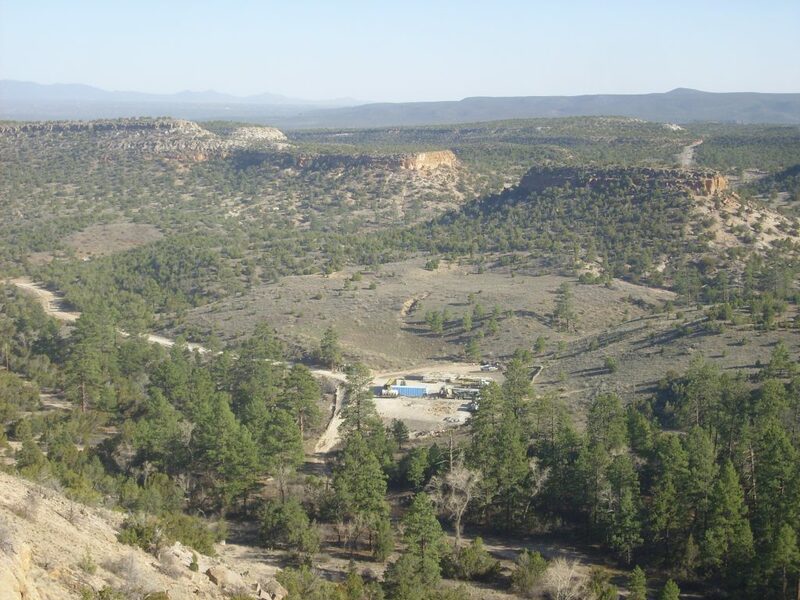 This descends into Los Alamos Canyon, where a new well is being drilled. They’ve been working on the well night and day for months. You sometimes see the south side of the mesa lit up at night when driving along State Road Four. Breakneck Trail has had significant improvements, such as these walled switchbacks. Below here I reach the B unit of the Tsherige Member, which has a deep reddish color. 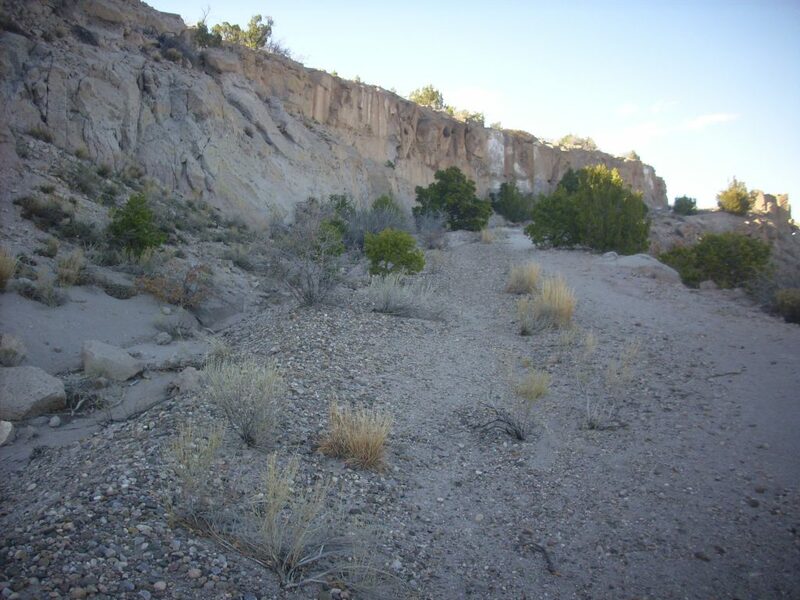 Further down, the trail crosses colluvium, rock and dirt that has fallen from the mesa. This is geologically somewhat uninteresting, so, after a time, I turn back. However, I get a chuckle out of a tree root filling the famous “vapor notch” between the A and B units. The “vapor notch” (in quotes because there’s some question what it really is) is prominent throughout the Pajarito Plateau. 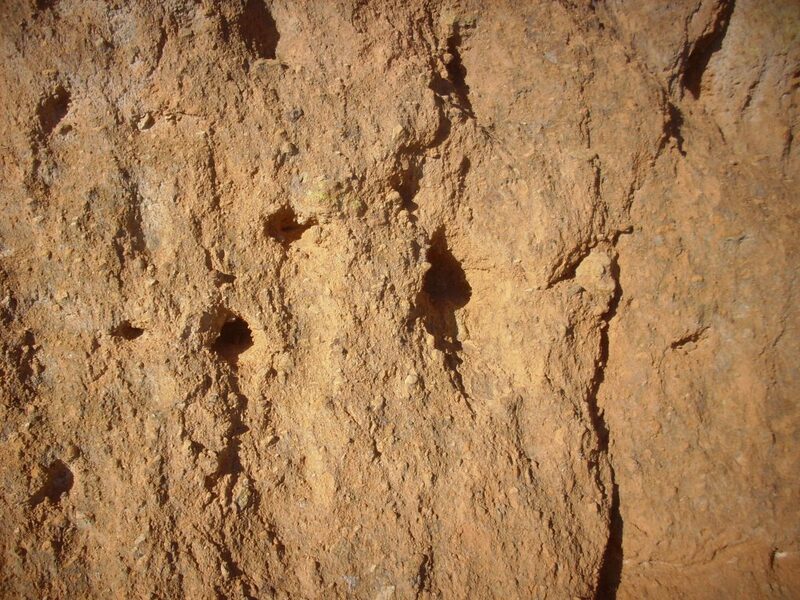 It appears to separate the first two pulses of the Tsherige eruption, but there is no petrological distinction in the rocks above and below the notch, except that the rock below still contains glassy shard while the rock above has devitrified. This, too, may be some kind of weird vapor phase process dividing a single eruptive pulse. Back at the top, I start up the old road where it switches north. This part of the road is still partially covered with gravel. It was an example what was called at the time a “metalled road”, which was the 1943 state of the art in fast road construction. Geology is an ongoing process. The mesa top itself is rather plain and I take no more photographs. The road continues west until it joins up with the modern highway where the latter reaches the mesa top (and the old road is again thoroughly blocked with boulders.) 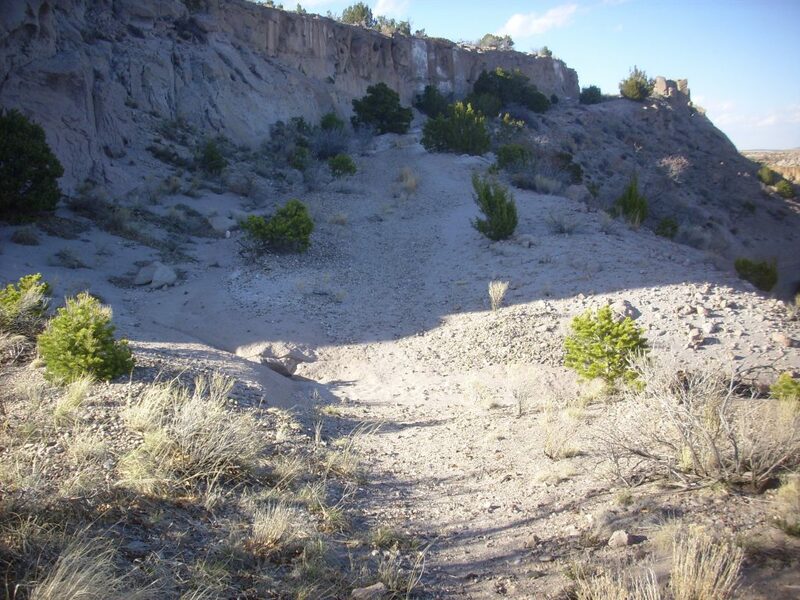 Hiking back, I kick over a couple of ant nests to see if they still contain any ants (yes) and notice a lot of bulldozer scars on the north side of the mesa, presumably from the early stages of constructing the modern road. There is also a sign and a bench overlooking the overlook; the sign is almost illegible. I just about get hit by a car trying to cross from the old road to the overlook parking. This is a treacherous stretch of road to cross, alas. Ironically, I was carefully watching some cars coming from the right when a car came around the corner from the left that I almost didn’t notice in time. I hike a lot of back trails, which sometimes makes Cindy nervous (though much less so now that I carry a satellite messenger and often take Gary Stradling with me), but the truth is that you can get accidentally killed in your own bathtub.